That’s a pretty good description of how Tygart Lake looks after much of its water is drained. The fall draw-down reduces the surface of the flood control lake and exposes another world. Huge boulders and other rocks and tree stumps are reminders of its past. The Taylor County facililty is operated by the U.S. Army Corps of Engineers, but was once rolling farmland before it was completed in 1938. 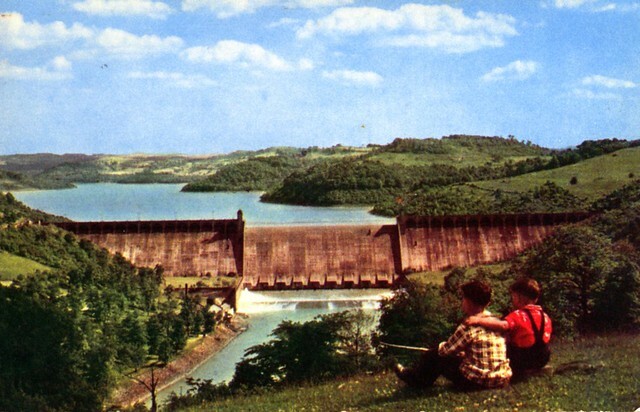 This well-known dam is on the Tygart River near Grafton. It is adjacent to Tygart Lake State Park which sits on 391 acres.The lake is 10 miles long, covers 1,750 acres and has 31 miles of shoreline. In the spring and summer, its deep water is a favorite with boaters, water recreation enthusiasts and fishermen. There’s even a swimming area complete with a sandy beach. But the reservoir level is lowered in the fall to help collect snow melt and spring rains. That’s when its lunar landscape is easy to see and makes for great photos.